You will find a wide option of San Francisco concerts in April. Top live music shows this month include Taking Back Sunday at the Warfield, Quinn XCII at the Masonic Center, and Excision at the Bill Graham Civic Auditorium. You will also find some great shows in Berkeley, San Jose and Oakland. Some top picks this month include Weezer & the Pixies at the Oracle Arena in Oakland, Pink at the SAP Center in San Jose, and Ghosts of the Forest: Trey Anastasio at the Greek Theatre in Berkeley. Venues in SF range from small, intimate options such as the Rickshaw Shop and Slim's to larger concert halls such as the Bill Graham Civic Auditorium that seats 7,000. You will find hundreds of San Francisco concerts in April 2019. There are several shows on stage each night around town. Here are just a few of the my top picks. 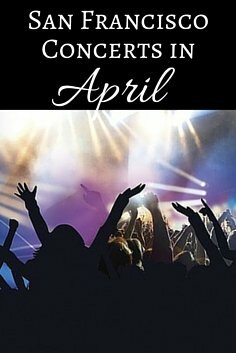 You will also find a variety of great San Francisco concerts in April at these top venues around town. Bill Graham and the Masonic are the two largest. The Warfield and Fillmore are well known options and The Independent and Slim's are local music lover favorites. In addition to the San Francisco concerts in April, you will also find some great shows at venues around the SF Bay Area. Berkeley, Oakland and San Jose all have large venues that draw in international artists all year long. Here are just a few of the top picks. You will also find other great SF Bay Area concerts in April in Berkeley, Oakland, and San Jose. Find additional details below. You will find tickets to these San Francisco concerts in April in several places. Here are a few places to look for tickets for all shows. Ticketmaster: This is one of the biggest ticket marketplaces for SF Bay Area and San Francisco concerts in April. They work directly with venues to sell tickets to all types of shows. Visit their site for tickets for upcoming concerts. Ticketliquidator: If you are looking for better seats or tickets to sold out shows, then head over to Ticketliquidator. It's a third-party marketplace that offers tickets for everything in San Francisco and the SF Bay Area. I use them all the time and have found some amazing seats through their marketplace. They also guarantee their tickets, so you won't have to worry about buying through them. Visit their site for tickets to April concerts in SF. Many of our top venues feature more than a dozen San Francisco concerts in April. You will find everything from hip hop to rock at these top venues. Cherry Blossom Festival: Enjoy four full days of fun at this year's Cherry Blossom Festival. The event covers two weekends in April. It's one of the first celebrations of the spring and features traditional Japanese music, food, and entertainment. Click here to learn more! 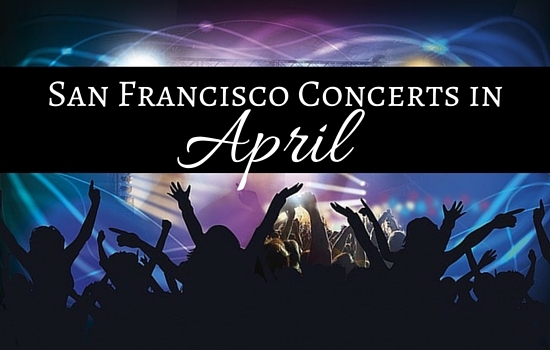 SF Symphony: You will also find some amazing San Francisco concerts in April with the SF Symphony. They perform everything from the classics to movie scores from top films such as Star Wars, Batman, and E.T. Full schedule of upcoming performances on this up-to-date calendar. SF Jazz Center: If you love jazz, make sure to head over to our new Jazz Center in Hayes Valley. They have a few stages with live jazz most nights of the week. Find their full calendar on their site. Other top cities around the SF Bay also have great concert venues. This month, three cities have some great shows for music lovers. In addition to the San Francisco concerts in April, you will also find several other fun events and activities. Here are some of the most popular. SF Giants Baseball: The SF Giants kick off their season in April in San Francisco. They play about a dozen home games each month from April - September. All games are played at Oracle Park (formerly AT&T Park) in SF's SOMA District. Click here for this year's schedule and more details on attending a game. San Francisco International Film Festival: One of the largest film festivals in San Francisco runs from mid-April to early May. The SF International Film Festival features hundreds of independent films from around the world. They range from documentaries to full length films. Click here for this year's dates and a full schedule of films. April Events Calendar: Want to see additional events and activities? Visit the April calendar for a full list of SF's top events.